Bay City Bike Rentals & Tours is not currently available. 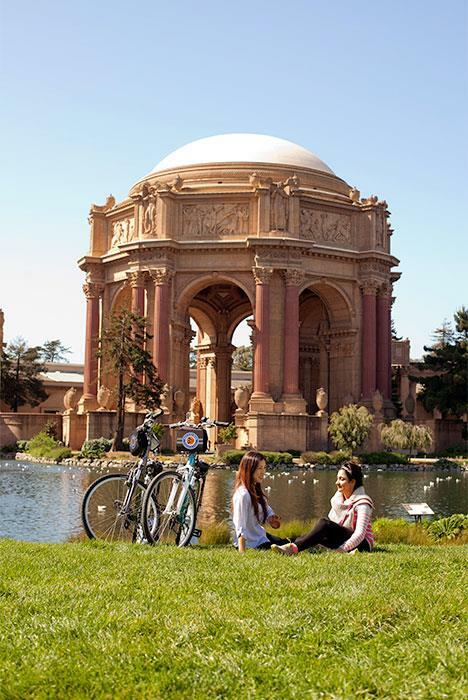 For the best views of San Francisco, hop on a bike! 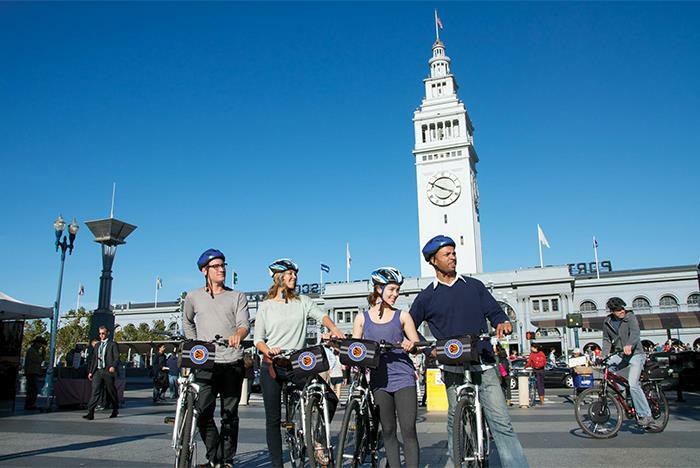 Choose the guided or self-guided bike tour that suits your interest and explore San Francisco at your leisure. 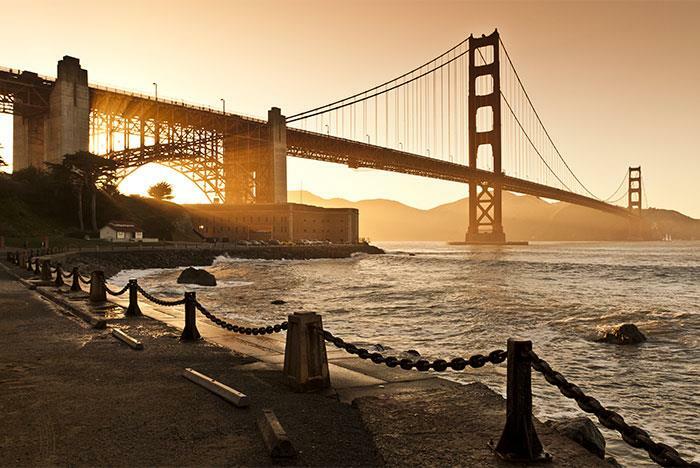 Along the way, you’ll see landmarks and sites including Union Square, Golden Gate Park, Crissy Field, and the AT&T Ballpark where the San Francisco Giants play. Guided tours include knowledgeable, local tour guides who will show you the way. Tours begin at five convenient locations: 501 Bay Street, 2661 Taylor Street, 2830 Jones Street, 2800 Leavenworth Street, and 1669 Haight Street. Restrooms are available at our locations. 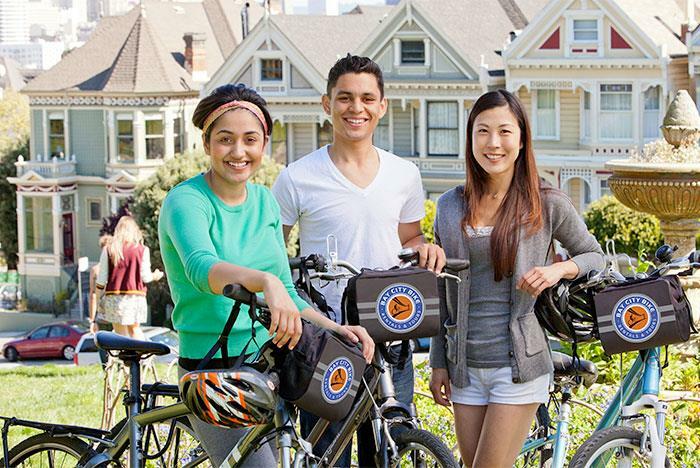 Bike tours are available 365 days a year, rain or shine. Helmets are included with bike rentals. Choose from several types of bikes. The up to 3-hour tour begins in Fisherman’s Wharf at our 2661 Taylor Street Tour Center. After a proper bike fitting where guests are outfitted with a current year model bike with front handlebar bag, rear gear rack, and a takeaway map. 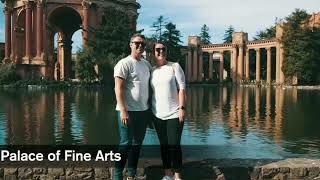 Daily Guided tour guests depart & follow the guide along the San Francisco waterfront past Aquatic Park, Fort Mason, the Marina, and the Presidio, through Crissy Field and to Fort Point. 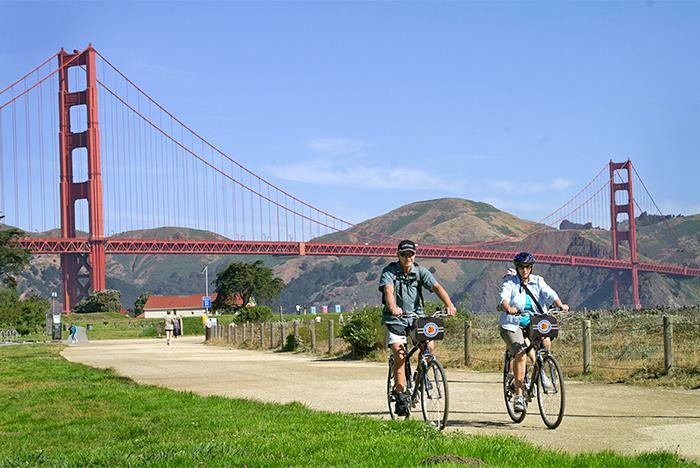 Riders cross the Golden Gate Bridge on a wide bike path, then through Vista Point to Old Fort Baker. 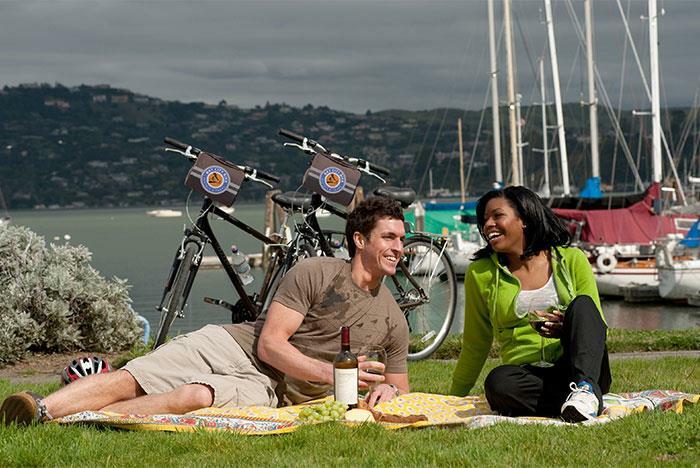 The tour finalizes in Sausalito where riders can enjoy the shops, the many art galleries, and the delicious food. Guests may return right after the tour completes with the included ferry ticket, or choose to keep the bike until closing hours, enjoying a BONUS BIKE RIDE. 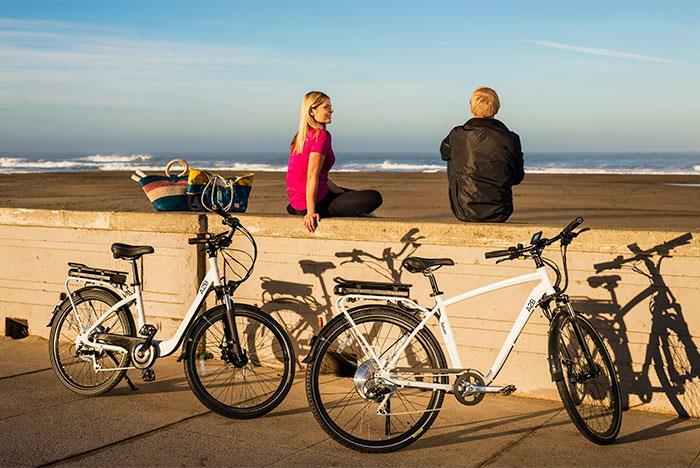 Ride Beyond the hills on this all-electric bike tour! 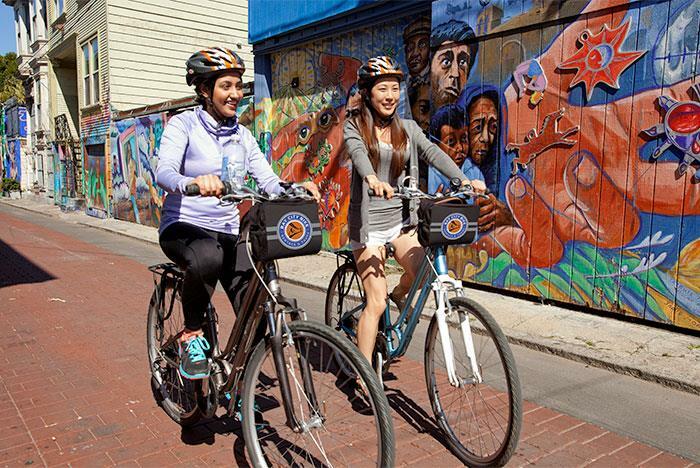 Explore the back alleys of North Beach’s “Little Italy” and pedal through Downtown – the beating heart of the city – on this quintessential San Francisco bike tour. 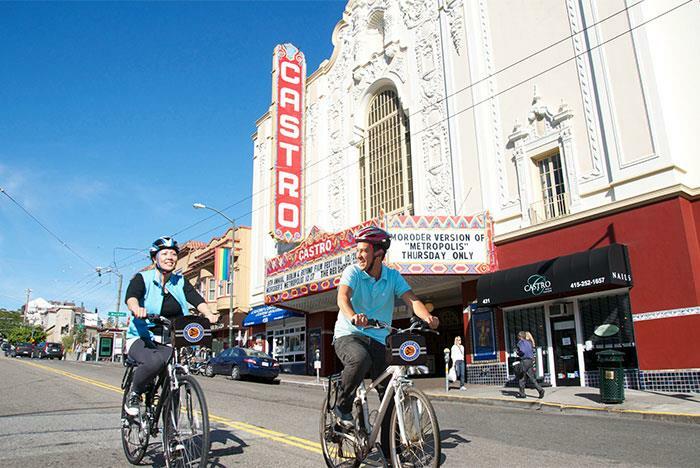 Loop around the Giant’s AT&T Ballpark, pedal into the culturally rich Mission District and ride through the colorful Castro and Haight Ashbury neighborhoods. We’ll cruise trendy Nopa, where you can snap a photo in front of the iconic Painted Ladies of Alamo Square, before visiting the Civic Center. 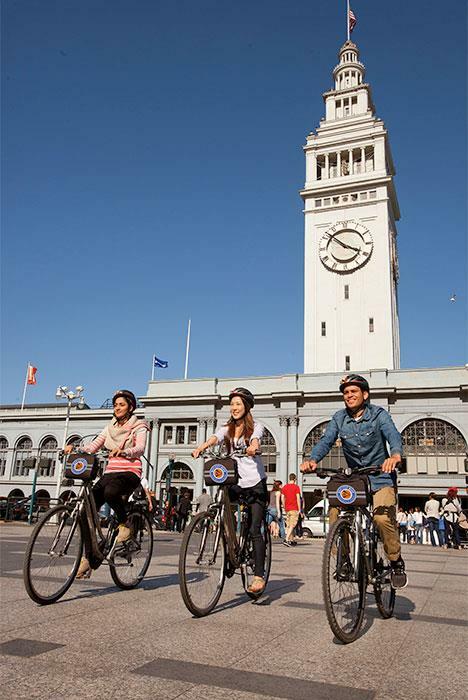 By the time we park our bikes back at Fisherman’s Wharf, you’ll know the city like the back of your hand. Awesome Nature. Experience the beauty of the bay and mountains as the city glows at dusk (bring a camera!). 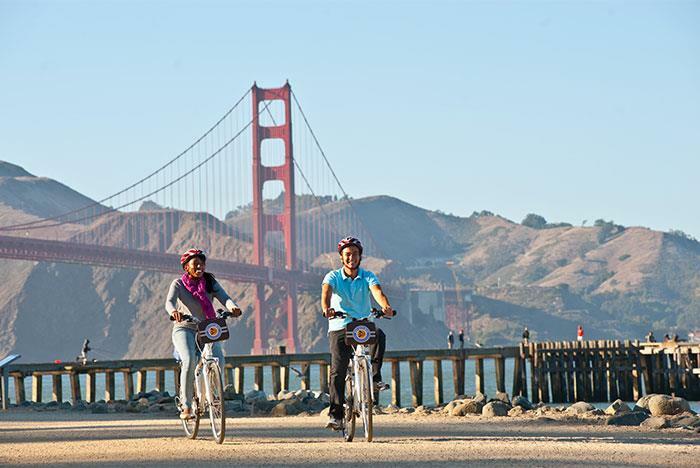 You will cycle exclusively on the Ocean side of the Golden Gate Bridge-open after 3 pm only for cyclists! The ride back is the “road less traveled” through the historic Presidio. Inside the 1000+ acre park, the opportunities are endless. 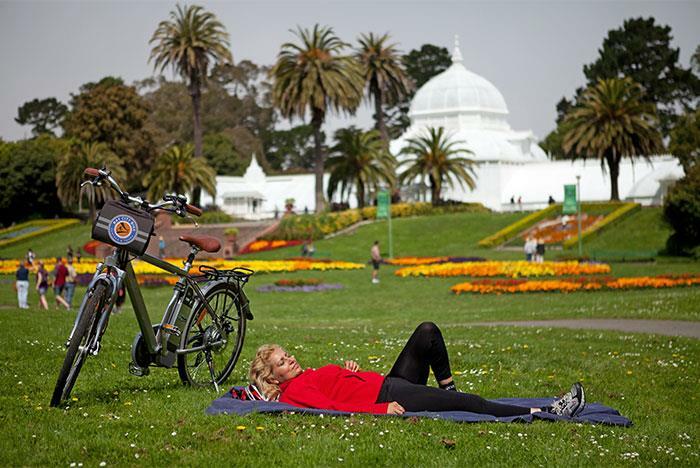 Riders will see the Conservatory of Flowers, Arboretum/ Botanical Gardens, Shakespeare Garden and Japanese Tea Gardens. Circling around Stow Lake, viewing Strawberry Hill, we learn some very interesting haunted ghost history! Later out on the beach, we point out oceanfront bike path and sweeping sand dunes that shore up the city. Heading back, we pass the Bison Paddock, Spreckels Lake and more. 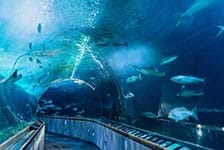 At the tours end, riders can visit our closest neighbors, California Academy of Sciences and the DeYoung – two world-class museums. Please Note: This Guided Tour departs from our Golden Gate Park location at 1669 Haight Street. Bike where you like! Guests decide the ride & enjoy the freedom of going wherever the path leads them. 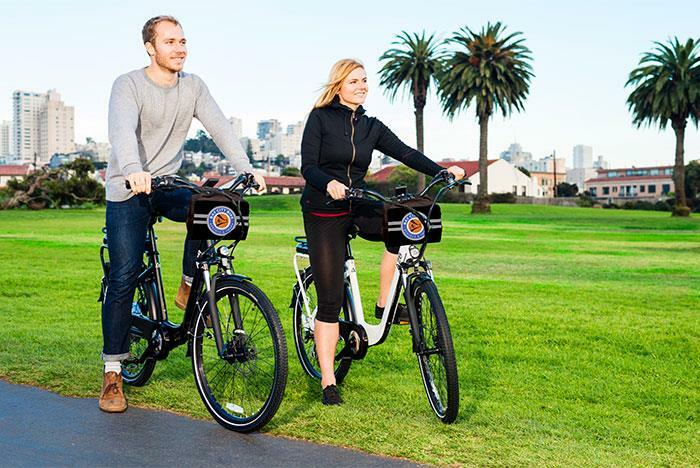 Beginning with anyone of our Fisherman’s Wharf locations, guests are outfitted with a current year model bike, helmet, front handlebar bag & rear gear rack, map, and route instructions. Riders tell Bay City Bike how many miles they wish to ride and our staff will show them a great route for a fabulous day out. 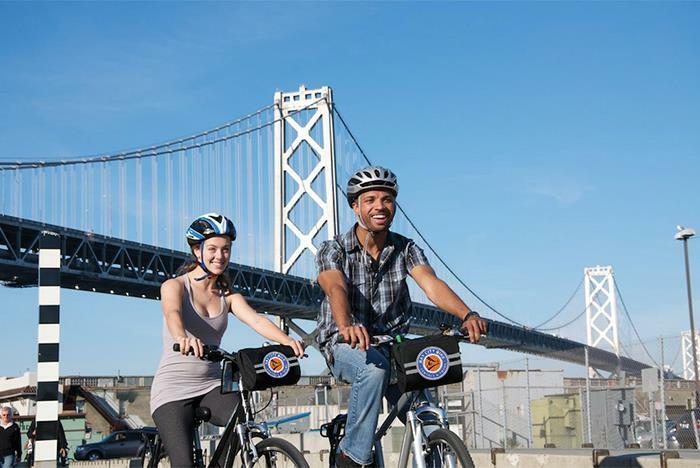 and the pedal assist system means a quiet, comfortable trip around the San Francisco Bay. • Golden Gate Park: 1669 Haight Street. Delight the whole family! Starting on the San Francisco waterfront, or inside the Music Concourse Of Golden Gate Park, ride where the road takes you. With everyone pedaling all that’s left to do is see the sights! • Marina: 10 Marina Blvd. 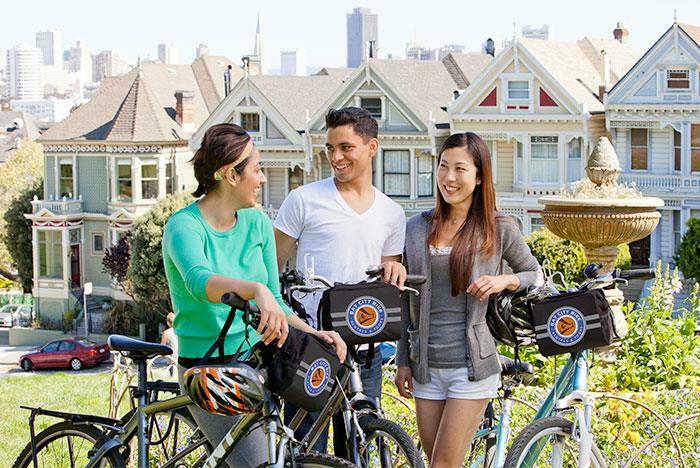 Have you been to Bay City Bike Rentals & Tours? Share your knowledge and be the first to review this. 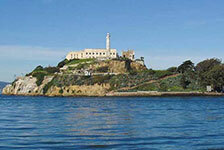 This tour is very fun for the tourist and easy to reach out Goldengate Bridge. Unfortunately the steel lock might be broken. If you join this tour, you should confirm the ferry schedule and have enough time for arriving. 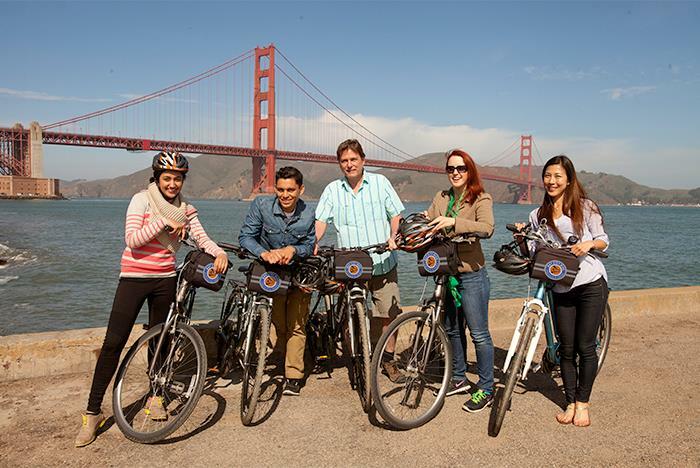 "The most amazing day with my family"
If you are going to visit San Francisco or even if you live in the area you must take a bike tour or rent with this company. It was the most memorable experience. Not only were the people so friendly and kind but the guide was so knowledgeable and fun! We saw things I never knew were here in the city. We took amazing pictures and stopped all along the way to hear all about the history! I was especially grateful that our tour guide slowed down to make sure the kids could keep up and were included! Thank you guys and we can’t wait to come back and try your electric bike and the city tour you suggested! See you this summer! "Must Do: Bike the Golden Gate Bridge"
Had the best day for - clear skies and warm weather which made perfect viewing of the Golden Gate Bridge. Guide was really good and there were plenty of photo stops/breaks along the way. Riding over the Golden Gate Bridge is a great thing to do. We had a fantastic time biking the bridge and venturing to Sausalito. Everyone that we talked with at Bay City Bike Rentals & Tours was great and very friendly! We will definitely come back! "BE SURE TO TAKE THIS TOUR WHEN IN SAN FRAN!" This was a great bicycle ride (be sure to rent an electric bike)! The route we took was very beautiful and picturesque riding over the Golden Gate Bridge. Our tour guide was very knowledgeable and patient with the slower people who were using the comfort bicycles and who couldn't keep up with the rest of the group. Loved Sausalito! What a cute little town. Be sure to take the Ferry back once the tour is over. This 8 mile ride is a real work out! Would do this tour again! Loved it! "Great trip. Clueless tour guide"
The bay city bike tours were pros. The trip and the views were exceptional. But our tour guide had no idea what he was talking about. Example #1: Me:when was the Golden Gate Bridge built? Tour guide: I really don’t know, I think 1929. (Google check while on bike): the bridge was started in 1933 and completed in 1937. It was a New Deal project. Example #2: Tour guide: troops were first deployed from Cressy Field in the, um, like, Korean War (1952). (Update by other rider who is a teacher): troops were first deployed from there in World War 1 (1917) and again in larger numbers in World War 2 (1941). Finale: Tour guide: —I accept tips and would love a great review on trip advisor— Finale #2: this is his review. Choosing a bike depends on the type of ride you are looking for. 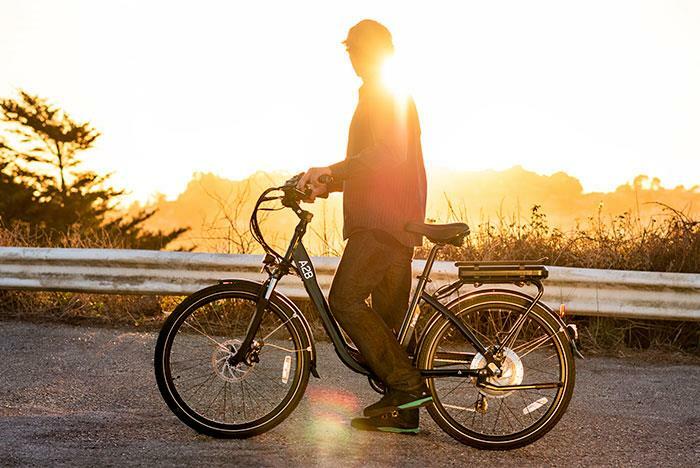 The most popular bike for casual, around-the-bay-trail touring is the comfort hybrid. The second most popular bike is the comfort mountain. For advanced rides up to Mt. 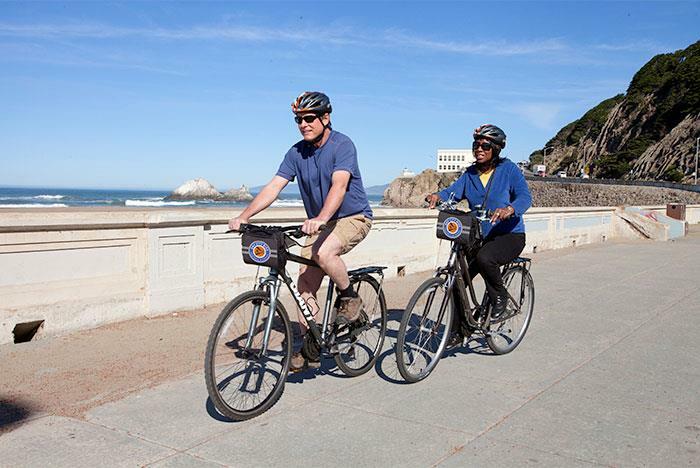 Tamalpais, a performance bike is recommended, while riding through the Marin Headlands might require an MTB. Please consult staff during check-in if you have any questions regarding your preferred route and which bike to choose. What is the difference between self-guided and daily guided tours? 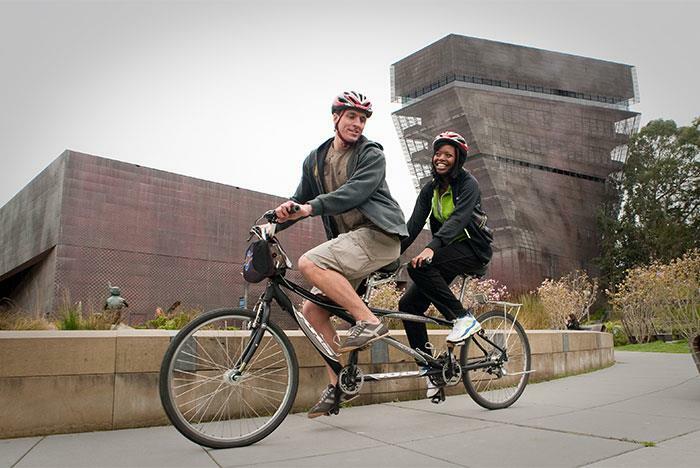 Self-guided bike tours are exactly that: self-guided. Our staff will give you a bike map and assist in determining the best route based on what you’d like to see. Our daily guided tours last up to three hours and are narrated by an experienced guide who leads the tour from Fisherman’s Wharf to Sausalito. 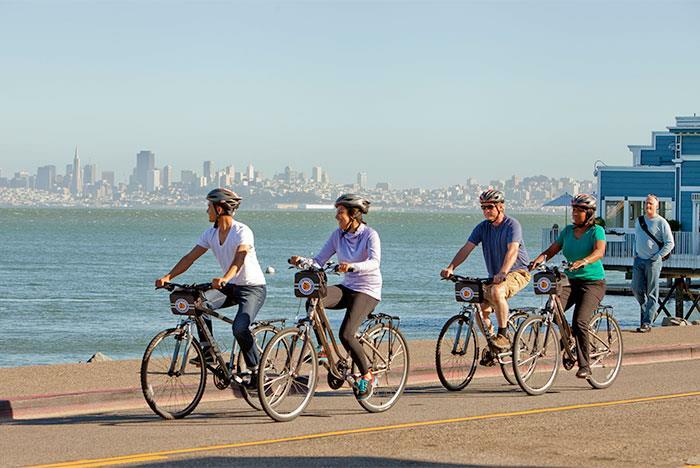 Daily guided tours begin at our 2661 Taylor street location and end in Sausalito where you have the option to bike back to Fisherman’s Wharf or return by ferry. The power-assisted eco-friendly electric bikes to come equipped with a motor and torque sensor that provides an extra boost when pedaling. 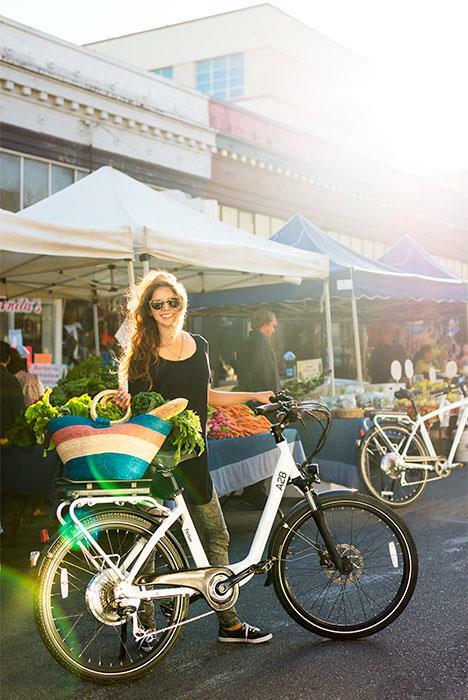 Electric bikes will help you get up those San Francisco hills and cover more ground without any extra effort. 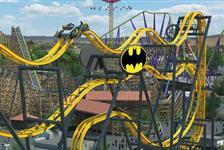 We have young children, can they do these rides? All kids have different riding skill levels. The good news is we have something for everyone! The baby seat can fit a six-month-old up to a sturdy toddler while the trailer is good for carrying 1-2 toddlers and their gear. Adults can pair up with a child, via tag-a-long or tandem bicycle: both are great for the budding cyclist who pedals only when inclined, but still feels the pride of the ride! Is a helmet included with my rental? Yes. California helmet law is mandatory under age 18. Will you give us a lock? 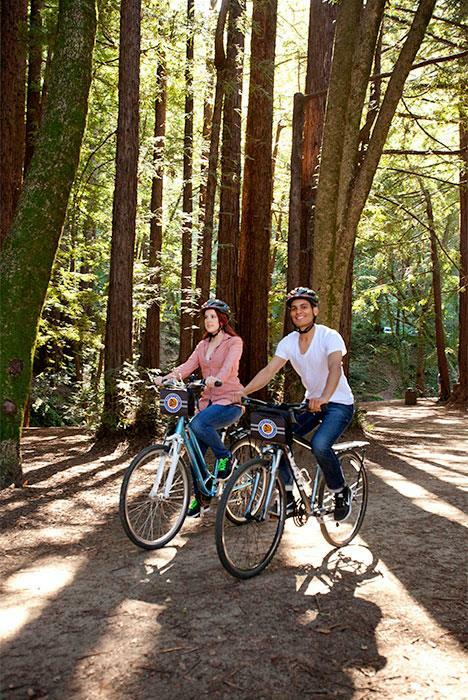 Included FREE with all bike rentals are helmets, front camera bags, bells, maps & map holders, water bottle holders, puncture repair kits, locks, and detailed map assistance. With the higher end bikes, those going long distances, we usually throw in a tube as well. I want to bring my own pedals. Can you put them on for me? Yes. Please note we change pedals on the performance bikes only. What will the weather be like? What should I wear? Weather in San Francisco can vary from neighborhood to neighborhood! Weather can be sunny one minute then foggy the next- and it's almost always sunny and ten degrees warmer in Sausalito! We always recommend layers: dress comfortably enough for your bike ride but also consider the variations in our weather. Also, the bikes have rear racks & Bungees to strap down any extra layers. Ponchos for rainy weather are available for purchase at our shops. How long is the day rental for? 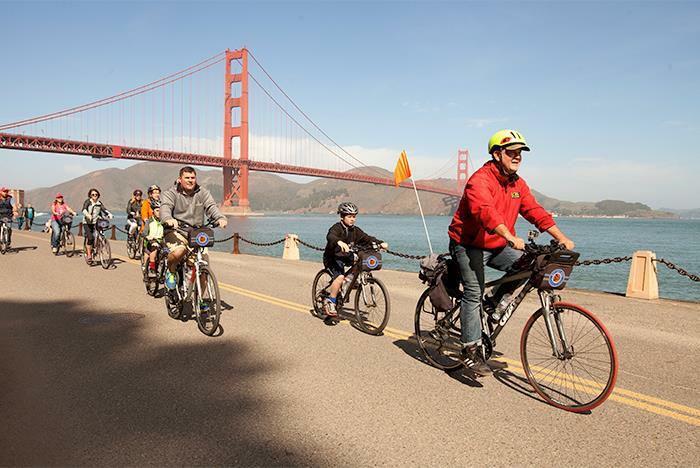 Is it possible to bike on the Golden Gate Bridge? The Bridge features a wide bike path on both sides. How do most people get back from Sausalito? Most people ferry as the 2 mile downhill into Sausalito from the Golden Gate Bridge is uphill on the way out. What happens if something goes wrong with the bike during my rental? Call the emergency hotline, 415-346-BIKE. Where do I store the bikes if I keep them overnight? Do not lock bikes up outside, as they are very likely to get stolen. Bikes kept overnight should be stored indoors-most hotels do offer complimentary bike storage. Check with your concierge! When should I arrive for my daily guided tour? Please arrive no later than 15 minutes prior to tour departure time for bike fitting and registration. What does the Daily Guided Tour include? Daily Guided Tours depart from our 2661 Taylor Street TOUR CENTER location only. What days and times are daily guided tours offered? 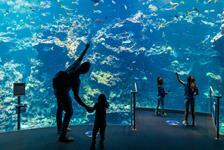 Daily Guided Tours are available at 10:00 am and 1:00 pm daily (depending on availability). How long do your tours last? Guided tours last up to 3 hours and depend on riding ability of the group. What happens if I am late for my tour? Do you offer tours in different languages? Tours are in English but our staff is international and can sometimes accommodate other languages. Please check with our group sales department for availability in other languages. Are gratuities included in the tour price? Gratuities are not included in tour price, and are not expected, but are of course welcome and a wonderful way to let the guide know how well they hosted you. Can I keep the bike after the tour is over? Yes, all guided tours come with bonus 24-hour bike rental. Can you rent from one location and return it to another? Yes, however, there is a $10 restocking fee; many people ride from the Golden Gate Park location to the Wharf and vice versa. Are tours available on holidays? Yes. Bike rentals and tours are offered 365 days a year. There are many garages and parking lots throughout Fisherman’s Wharf. Parking costs vary by the garage. There is also metered parking throughout the Wharf area.